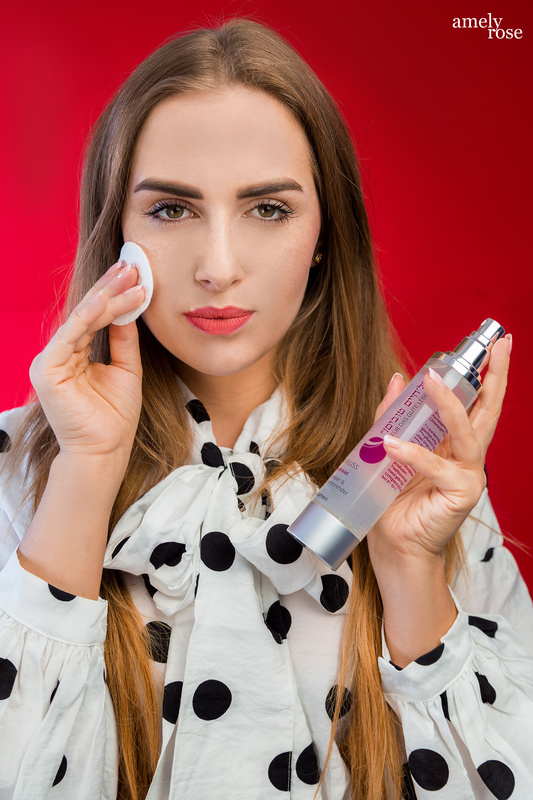 Update: I decided to write a detailed Catwalk-Post, because the DIY-Video-Tutorial is with more than 6.000 clicks the most popular one on my channel. Hope you love the written-version as much as the clip. It’s monday, which means it’s time for another CATURDAAAAaaaaay! Today I show you my very first YouTube video. Well, it’s actually not my first one, but it’s the „oh look I am a Youtuber now“-type. And the beginning of my glorious future as a YouTube-Star. And probably also my last video – for I am such a lazy person. Just to make it simple – the „amazing“ dance move during the intro is how I move when they tell you „act normal“. And noooo, I had no idea my boyfriend was already recording. And yeeeees, this is now my official intro and you get to see this stupid dance move every time and I literally feel your naked spite. Because my boyfriend, the fat jelly, gloated over my misfortune, too. Note to self: never, every, every (!) dance this unrestrained again when there’s a camera in the room. No matter if it’s your own boyfriend, who cuts and edited the video, then especially you should be really careful, ’cause I promise you – your boyfriend has no problem to make a fool of you IN PUBLIC. And these 5 second heedlessness will be in every video (intro) again and again and again. Just in case you don’t want to read this entire post, to get all information about where to get stuff for your catwalk, need some inspiration etc – watch the video. BUT so far it’s only in German. I’m sorry! I’ll try my best to make some English videos soon, too. However, if you need your daily dose of cute catcontent, this is YOUR video. Go and check it out. I have two pictures in my entire flat and I am really proud to at least HAVE pictures in my flat. There isn’t even a single chair or desk and probably you won’t ever find any curtains here. This might sound as if I don’t have the magic touch for this home decor-thingy. Wrong! I love to decorate… for cats. That’s why I have not just a rack, but a huge Catwalk for my cat “Cat Walk”, in my living room. Actually the name of my cat (you can follow him on Instagram ) but a Catwalk is also a cute description for a climbing-wall for cats. There is neither a specific look nor wrong or right when it comes to the construction. 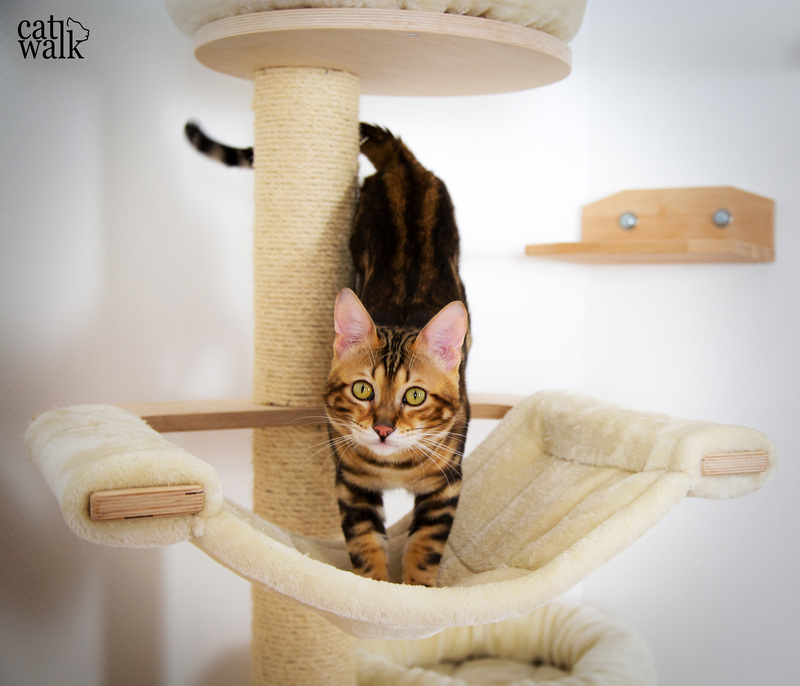 The main point is that your cat has fun and a possibility to climb, play and rollick. The basics are with sisal coated pieces (beams – better use wood, when you too have a heavy cat – or you can even suspend a sisal carpet to the wall). Sisal is perfect for claws and cats love to sharpen them on such a carpet. They can also climb better on a sisal coated piece. Other basics are simple beams, where they can sit or use them as stairs and maybe a sleeping place. You can build the catwalk on your own or use normal IKEA beams. If you are aren’t good with your hands, there are many cool sets and single pieces that come in various shapes, colors and prices. Do I need a Catwalk? I struggle with all those „you have to do“-phrases and forced things. And let’s be honest, just in case I would buy everything a cat allegedly needs, I would starve and my cat probably would live in his own flat, even bigger than mine! In the end you know what’s best for your furry baby. My cat doesn’t need his climbing-wall forcing, but he loves it and it’s an amazing playground that he uses daily. Plus it’s his favorite observation platform (very important for cats). I am so happy that we bought such a catwalk and will start adding more pieces soon. We also plan to attach more catwalks in the other rooms too, so he can play, sleep and observe every room. It’s (next to the cat tree and all those mouse-toys) the best thing we got him. But it’s also a good option for a shy or calm cat to have a place to hide and observe and find some neutral space, most of all when you have some „annoying“ family members (or other cats). What are the most important pieces of a Catwalk? As I already mentioned, there is no wrong or right and you can do literally anything you want. 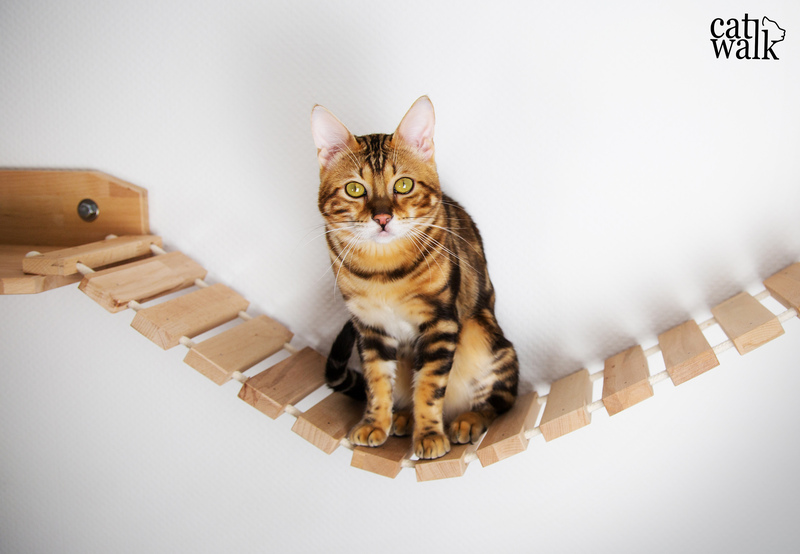 I promise that there are enough parts for the Catwalk to fulfill your (and your cat’s) wildest dreams – and if you can’t find a specific unit that fits: build it. I adore the single pieces that you can combine the way you want and adapt them to the space and room you have. We have an amazing cat tree. It looks really simple (a hammock, two sleeping places, a cave that he never uses and a cushioned step) but the tree has thick stems and therefore is extremely stable. A must-have and whatmy cat, Cat Walk loves his tree. But this is definitely not a must-have, only when you have a Bengal „tiger“, too. We have 2 climbing rungs (you can use normal boards) and add them as a connecting piece between the actual Catwalk and the cat tree. Something to balance on. 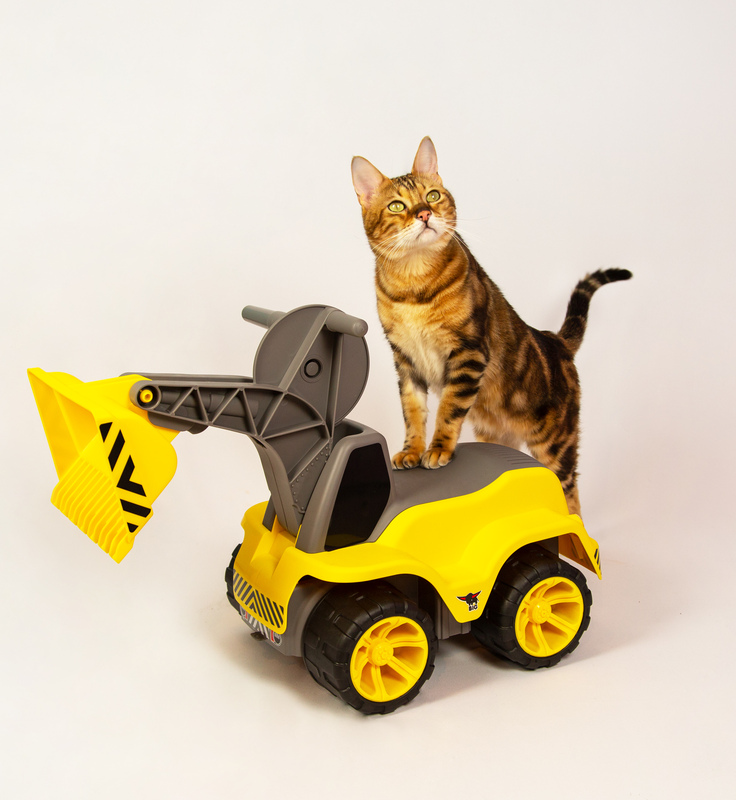 This is definitely not a must have, but our cat’s favorite part. This is just a simple cat tree stem that it attached horizontally, with two shelfs at the ends. We place this part directly above a door, so whenever we leave the room Cat Walk sits on this part and observes us. But he also plays there – be interactive with your cat, use the cat toys there too, your animal will love it. I promise! A bridge and I have to admit, I bought this bridge for myself. It just looks super cool. My tiger was suspicious at the beginning and was afraid to walk on it for days. Meanwhile, and I have no idea why, this is his favorite sleeping place. And at the end a sleeping corner. You don’t need a corner, it just suited our room perfectly. You can finish your Catwalk with any other part or use other sleeping places. For example a hammock or a cool, big cave. 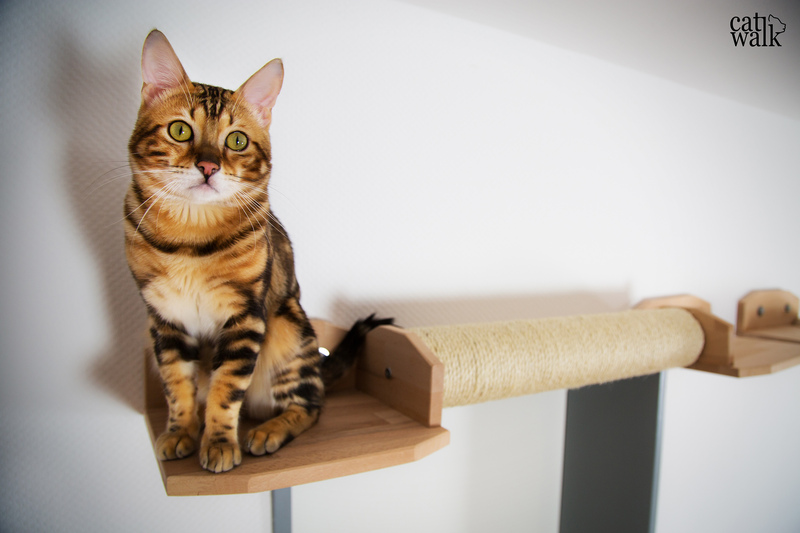 You can buy single parts of your cat tree and add them to the wall too. I have to admit that our cat never used this corner-bed. I have no idea why, but he avoids this place. Let’s be honest: cats never sleep in the bed you buy them. 😀 They sleep in YOUR bed or on your favorite spot on the couch, on a goddamn bridge…but definitely NOT in a bed you bought them. And I made this mistake six (!) times. Keep in mind these are the units WE used, you can use whatever you want and there are also other cool pieces on my wish list, too. The pieces I mentioned are the basics and most „important“ ones, your cat will probably love them too. Just browse the internet for more inspiration and try something out. Such a climbing wall is for sure a cool playground for your cat(s). They are way too small. You can buy some cool sets, but the best is to build all parts on your own. I paid for each unit about 30-40 Euro. The shelfs are cheap, you get some for less than 10 Euro, the sisal carpet was roundabout 50 Euro and for the bridge, the sleeping places etc. we paid 40+ Euro per piece. Altogether we paid nearly 200 Euro, not counting the cat tree (the tree was about 150 Euro) and this is really inexpensive, considering the quality and how much Cat Walk loves his Catwalk. Furthermore I found some shops, selling one part for about 100 Euro – I got my entire (!) catwalk (6 things) for twice as much. But, I promise your cat will love it. Be interactive and play on that Catwalk. Especially when you have a house cat and no possibility to offer your cat some space in nature, it’s important to offer at least enough alternations, adventures and exciting surroundings at home. 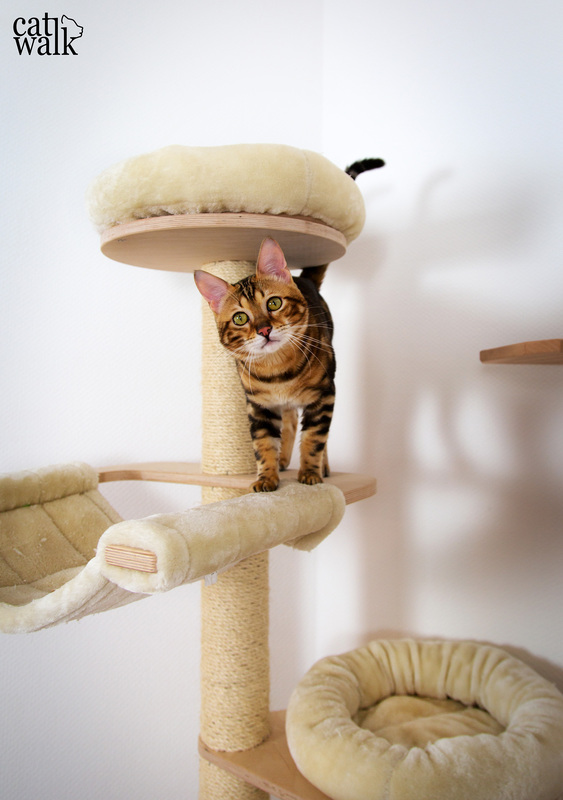 And the easiest way is to create such an exciting playground with a cat tree and a catwalk. Furthermore it’s HIS (Cat Walk’s) own home range, a place we (me and my boyfriend) can’t use, a place that’s totally his. In my case the cat tree and the catwalk was worth every cent. And now, watch the video to SEE the entire Catwalk, how we assembled it and of course, to get your daily dose of cute cats. 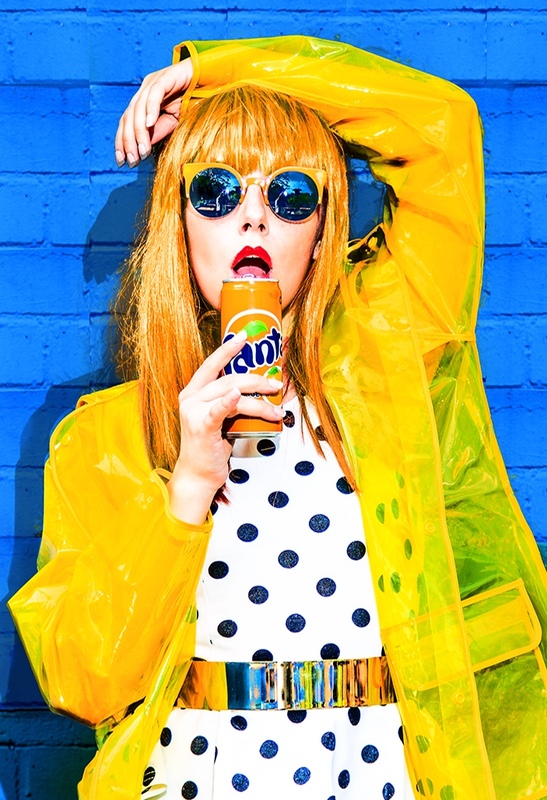 Tolle Idee mit dem Catwalk. Ich überlege auch schon lange einen für unsere Katzen anzuschaffen. Deiner gefällt mir sehr gut! Das ist ja total süß und die Katze ist einfach zum Knuddeln. Super tolle Bilder, sie gefallen mir echt gut 🙂 Benutzt du einen Filter oder sind sie einfach durch die Kamera und das Licht so geworden ? This is pretty amazing, it’s like a kitty cat wonderland. Need this! hahah thank you, it definetly is. 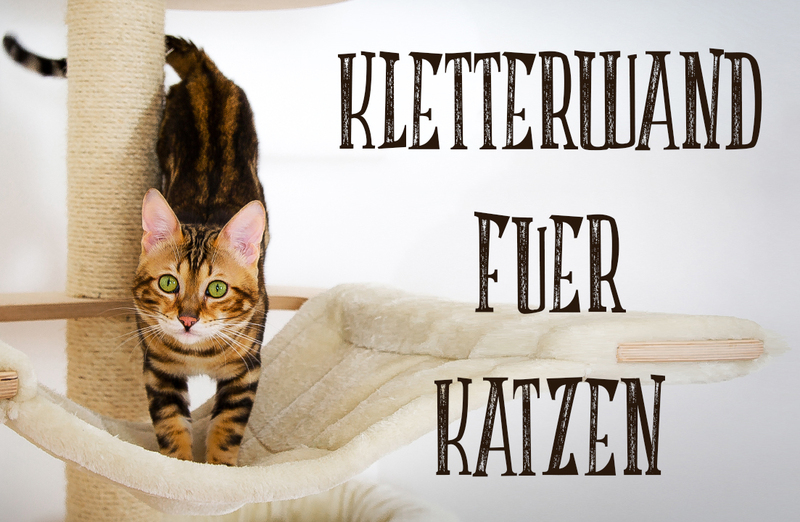 Super süße Idee Liebes ♥ Ich glaube, unsere Katzen würden sich auch riesig über so einen Catwalk freuen :-). Da ich selbst keine Katze habe, ist das ein Thema bei dem ich überhaupt nicht mitreden kann. Aber natürlich verstehe ich, wenn man seinen Mitbewohner so richtig verwöhnen will. 😉 Allem Anschein nach scheint dein Kater wirklich einen richtigen Abenteuer”park” zu haben. Zumindest sieht das definitiv viel spaßiger aus als das was ich sonst so an Kratzbäumen etc kenne. einen “normalen” Kratzbaum haben wir auch, ok 2 aber das reicht nicht.